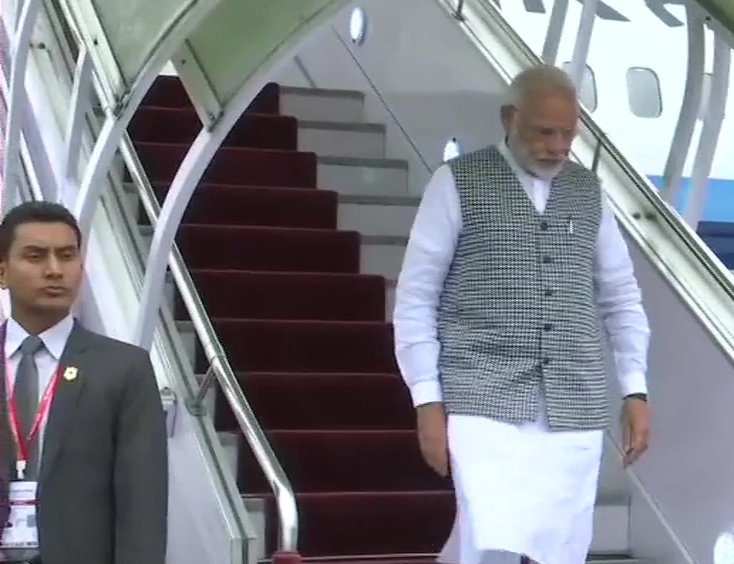 Indian PM Narendra Modi arrives in Nepal today. He reaches there to attend the 4th BIMSTEC Summit. He landed there at 8:30 am. This summit will be held for two days i.e. 30th and 31st August. This is the fourth visit of PM Modi to Nepal during this tenure. Nepal’s Deputy Prime Minister and Defense Minister Ishwor Pokhrel received PM Modi at the Kathmandu airport. Know more. Know what PM Modi’s agenda On today’s agenda, PM Modi will take lunch Nepal President Bidhya Devi Bhandari. The dinner will be hosted by Nepal Prime Minister KP Sharma Oli. PM will also hold meet with leaders of other nation at the sidelines of the event. Tomorrow, Narendra Modi will have a bilateral meeting with his Nepali counterpart KP Sharma Oli. They will also review the progress of bilateral ties since his last visit in May 2018. Both the leaders will also inaugurate the Nepal Bharat Maitri Dharmashala at the Pashupatinath temple complex. This summit focuses on enhancing regional connectivity and boosting trade. To attend this summit, leaders of BIMSTEC countries like Indian PM Narendra Modi, Thai Prime Minister Prayut Chan-o-cha, Bangladesh PM Sheikh Hasina and others reached Nepal. BIMSTEC stands for Bay of Bengal Initiative for Multi-Sectoral Technical and Economic Cooperation. It includes group of seven countries including Bangladesh, Bhutan, India, Myanmar, Thailand and Sri Lanka. It includes nearly 22% of the world’s population, and has a combined GDP of over $2.8 trillion.